Street Bikers United Hawaii (SBU) and the United States Marine Corp Reserves sponsored the 36th annual Toys for Tots parade through Honolulu, Hawaii on December 5, 2010. 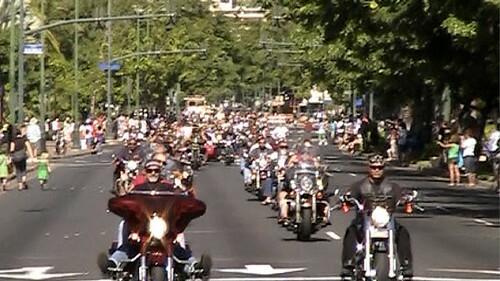 The ride draws between four and five thousand bikers to Waikiki. Ray Pagan, Street Bikers United Hawaii State Treasure, said bikers come in from Japan and the mainland also. Ray and Rick Davis organize this annual event. Pre-event work includes gathering donations from businesses to offset expenses which are over $12,000 each year. Bikers are asked to donate $2 each to ride in the parade. Money raised pays for police, permits, insurance and other expenses. There is much work involved and they organize the day because of the kids who benefit from the toys. Marines stationed at Kapiolani Community College collect over 10,000 toys at the end of the parade route, it’s no surprise that the most common toys given are the fastest RC trucks and cars. Yesterday, Christmas morning was brighter for 10,000 island children because of the generosity of SBU, riders and sponsors. We checked out the bikes and talked to the riders at Magic Island before the parade start. Emcee Michelle Shockley from KPOI 105.9 FM and music from Flux Capacitor entertained the crowds. Club members mingled and checked out the motorcycles decorated with holiday ornaments and loaded with toys. The Kaneohe Windward Harley Owners Group was well represented. Hawaii depends on tourism and this event contributes. Every year we watch tourists lining the parade route and cheering on the bikers. Off island riders stay at Hawaiian hotels, eat in restaurants and patronize bars. Some Waikiki residents are calling for an end to the parade due to noisy bikes. SBU reached out to each club in advance asking for their cooperation. Before the parade start, Rick reminded riders to be respectful of Waikiki residents and not rev their engine on Kalakaua Avenue. 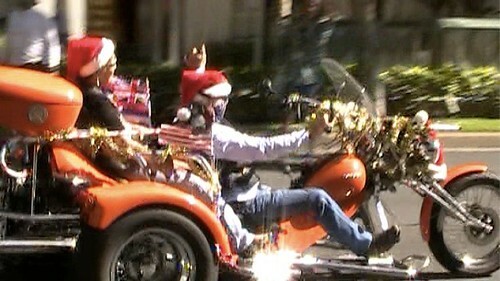 Riders came out decked in holiday colors and we even saw a few Santa and Mrs. Clauses in the parade. Bikes of all shapes, sizes and styles were represented from Rick Davis’ orange trike to a pink Vespa Barbie and everything in between. 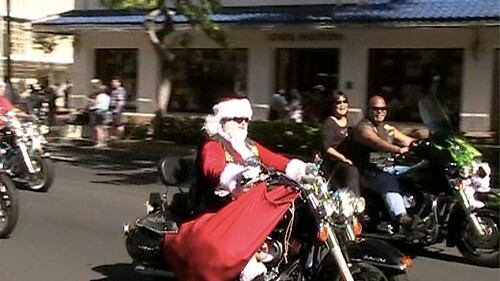 See video from the 2009 Honolulu Toys for Tots motorcycle parade. Click on the image below to see the “Where Are You Today?” video of the 36th annual 2010 Honolulu Tots for Tots parade along Waikiki Beach in Honolulu, Hawaii.